Lodgical (My Thoughts on Masonry): Google's new branding and favicon - "Little G"
For those of you who use Google, you may have noticed today that their favicon changed. That's the little icon that appears in the location bar and on the tabs where a Google site is opened. Why am I posting about it here on my Masonic blog? Because anyone who is observant enough to notice such a small change really ought to study the history and symbolism of Freemasonry, they would find it fascinating! 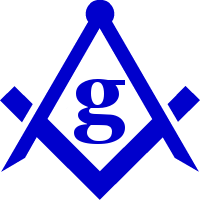 In fact, Masons have used the "Big G" as part of their Logo for quite a while, as pictured here. Does Google's change to the little G represent a sign of humility, a stepping away from territory that clearly has belonged to us Masons since before Sergey Brin and Larry Page even had grandparents, or does the little G represent a new, modern trend that we should take notice of and follow along with, as well? Well, what do you think? I kind of like it. Not quite web 2.0 enough, IMHO. Yes, I like them both. That is a great idea. I think I will have a ring made with the "little g." Much more modern and up to date. And if google jumped off a bridge, would you do it too? Seriously, why not take the G out of the area between the square and compasses altogether? I mean, it's not used much outside the US, and certainly hasn't always been part of the symbol, and no one today can agree on what it originally means. I have been talking to people about he 'G' within Google and its icon and symbolic meaning. Ever notice that the old fashioned 'g' has been taken out of the type writer? It is the serpent, hermes. Thanks to the op, now I know I am not alone in thinking that Google is owned and ran by Masons.